March was a bit slow for this reader. (I blame vacation.) I only read 8 books, and one of those was basically a comic for pity's sake. What I lacked in quantity I surely made up for in quality as this was a great month in reading. The Storied Life of A.J. Fikry was easily my favorite fiction of the month. Read it! Even though Below Stairs wins favorite nonfiction by default (it was my only one!) I want to point out that it was absolutely delightful. How was March for you? 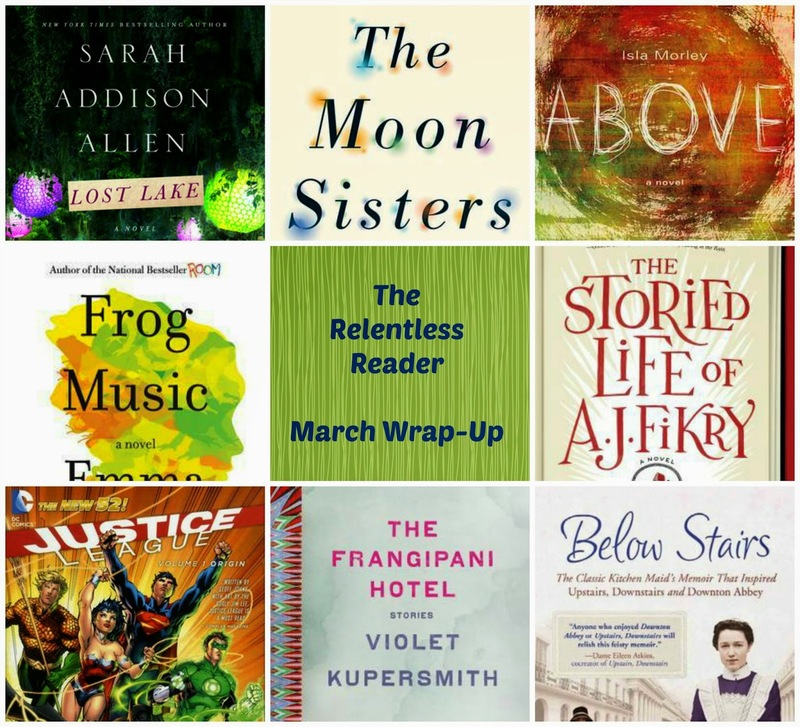 Do you have a favorite book of the month? I'd love to hear about it below! I'm so glad to know Below Stairs is delightful! And AJ Fikry! Can't wait to read them both. My favorite was Wives and Daughters. I'm going to look up AJ FiKry. I definitely want to read AJ Fikry after all the great things I've heard, maybe a book about loving books will be just the spark I ned! I was having a bit of the blahs when I picked that one up, Shannon. It perked me right up and I expect it will do the same for you! I'm so close to finishing A.J. Fikry (under 30 pages)! It's probably one of the best books I've read this year. I also read The Frangipani Hotel and it was okay. I really want to read Frog Music, but not sure if it will happen any time soon. I haven't read anything by Emma Donoghue. She actually lives not far from my in-laws. I can see Fikry being in my tippy top faves of the year. It's fantastic! I really liked Frangipani...thought it was so spooky and lovely :D If you want to read one of Donoghue's books I'd read Room. It's different from anything I've read before or since. I just heard about Fikry today...looks like a great read! I'm about halfway through Fikry and it's the perfect book for book lovers and book bloggers. I've flagged so many gems of passages so far. I have The Moon Sisters on my floor right now but think I need to get back to East of Eden first. Happy April missy! Fikry is nearly perfect :D I think it was written with bloggers in mind...that's what I'm telling myself anyway, lol. I'd like to re-read and mark up my copy like I should have done the first time! Happy April to you as well, have a great one! The books you listed as your favorites are the ones I am most excited about -- they sound great! You have a lot of books on this list I want to read. Thanks for destroying my TBR (again). :) Happy April, doll! I live to serve! :D Right back at ya. Have a grand one! I loved AJ FIKRY too!! Stuck in an airport for very many hours, I read Coetzee's 'Summertime' in its entirety. I enjoyed the irony, but ended up feeling very sad for him. He wasn't laughing as he wrote it, I'm sure. Some memorable lines, but I wasn't riveted and caught up in the read as I was for 'Disgraced.' However, the 'voice' of the Brazilian was amusingly evocative. Sadly, I haven't read any Coetzee. At this point I wouldn't know where to begin! He's on my list of authors to get around to...soon! And the Mountains Echoed was my surprise winner for the month. I'd never read any Hosseini before, but he's definitely on my list now! Argh! I want to read that one so badly! I really need to request it from my library. Ohhh go read The Kite Runner, it's amazing. So glad I stopped by and found out about A.J. Fikry! I think eight books in one month is pretty productive. If I can read 6-8 books in a month I feel pretty happy. I had a lot of deadlines and tons of grading in March. I kept reading, but things were pretty quiet on the blog. I'm glad you stopped by too! First of all I dig visitors ;) Second, Fikry is so so so good and I want the world to read it! Looking forward to your thoughts on Lost lake! I'd die to read 8 books! :) These days I'm only getting in around 4. Sigh.